Chapel Hill Bird Club – "Return of the Eagles"
Leornian Book Club, Graham – "Gardening for Birds"
Alamance Partnership for Children, Glencoe Outdoor Learning Center – "Backyard Birds"
Elon University, Life @ Elon series (two 2-hour presentations, one in the morning and one in the afternoon) – "Return of the Eagles"
In addition, Lynn Moseley installed these two bluebird and nuthatch boxes at the Alamance County Agricultural Extension Office in Burlington. These may well be the first nest boxes placed on the extension office’s property. Chapter co-chair Dennis Burnette also has been busy in the past month. The scheduled speaker had an emergency on our meeting evening, April 14, so could not do her presentation for the T. Gilbert Pearson Audubon Chapter. Dennis Burnette was a last-minute substitute with a program on gardening and landscaping for birds with native plants. Twenty people attended. On April 19 Dennis Burnette did a “lunch and learn” presentation at Reynolda Gardens in Winston-Salem for 21 attendees. Although the topic was meadow butterflies, he included Bird Friendly Communities information about planting native plants as he talked about attracting insects that birds could eat. He even worked in a few comments about the Brown-headed Nuthatch nest box project. There were a lot of questions from the audience and several people were making notes throughout the talk. About 45 people heard about gardening and landscaping for birds with native plants from Dennis Burnette on April 23 at the NC Bluebird Society Annual Conference at Haw River State Park. Many of the plants illustrated in the presentation were available for sale by a vendor at the meeting thanks to the coordination by Lynn Moseley. Pearson Audubon member Sarah Gilley attended a "Lunch and Learn" talk on gardening with native plants in April at Paul J. Ceiner Botanical Gardens in Kernersville. More than 70 people attended. the PowerPoint presentation included birds as well as the Audubon NC logo. During the Q&A, Sarah made an announcement about Pearson Audubon programs and Audubon's Bird Friendly Native Plants initiative. Six hardy souls gathered the morning of April 9 at the at the Audubon Natural Area in Greensboro for the Great American Cleanup in conjunction with Greensboro Beautiful, Inc. The day was crisp and bright, perfect for spending some time outdoors. The group canvassed The trails, a bit of creek bank, the shrubby area at Church Street and Tankersley Drive, and of all the streets bordering the property. They collected the equivalent of two full garbage bags, some lumber, and a tire that someone had recently donated to the site. Bonuses were one deer sited crossing the creek, and a Mourning Dove on a ground nest incubating two bright white eggs. The nest was in the hedgerow along Tankersley about 20 meters north of the "entrance" to the area. The steward, Jim Eldrett, was compensated with one very old dollar bill found in the brush. In addition to Jim, participants included Lynn Allison, Alexandra Suitt, Brianna Wiley, Kimberly Fierro, and Cameron Hoyle. Folowing a successful launch in 2015, Audubon North Carolina’s Bird-Friendly Communities program continues to grow building connections between gardeners, bird lovers, and plant nurseries, all to benefit our state’s beautiful and diverse bird populations. Bird-friendly native plants are a key piece of Audubon NC’s Bird-Friendly Communities conservation effort to support imperiled birds in North Carolina. One of the 2016 featured plants, American Beautyberry, provides berries that offer a perfect fuel to migrating Black-throated Blue Warblers as they pass through NC. Research shows that migration is the most hazardous time of these birds’ lives. Providing more fuel could help more of these birds survive to better sustain the population over time. In one year, Audubon NC saw tremendous success in the effort to spark and sustain a thriving bird-friendly native plant economy. To date, 500 citizens, about 70 retail partners and 2 municipalities have signed-on to join the program and commit to growing and planting bird-friendly native plants recommended by the organization. Most recently, the City of Winston-Salem and the Forsyth County Governments updated each community’s Suggested Plant Material List to include more bird-friendly native plants. The lists will serve as guides used by developers and builders, and by city and county inspectors in approving site plans for plantings. Audubon North Carolina has created a list of plants curated by bird and native-plant experts to offer a range of plants that offer the food birds need during each season, as well as a statewide list of nurseries offering these bird-friendly native plants. 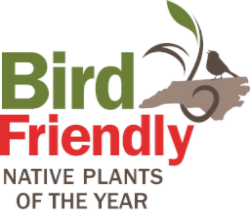 Visit the Audubon NC website to learn more about the Bird-Friendly Native Plants of the Year program and to find a local bird-friendly plant retailer visit nc.audubon.org. Summer Fun Nature Walks - Locations and times to be announced! Check the June issue of Nature Notes! All photos in this issue of Nature Notes were taken by Dennis Burnette, unless otherwise noted. For our May meeting, we are fortunate to have as our speaker Dr. Olav Rueppell, Professor of Biology at UNC-Greensboro, and internationally-known authority on honey bee ecology, social behavior, genetics, and colony health. Considerable attention has been given to the severe health problems that honey bees and other pollinating insects have suffered in recent years. After discussing the significance of the symbiotic relationship between pollinators and plants, Dr. Rueppell will explore some of the major ideas suggested to explain declining pollinator health. This discussion will focus on the honey bee and will describe some of the research that he and his students are conducting at UNCG to solve the problems. Join us on our Second Sunday Nature Walk on May 8. In keeping with our theme about native pollinators, we plan to visit the relatively new Pollinator Garden at the Guilford County NC Cooperative Extension Center. Of course, not all the plants will be in bloom this early in the season, but we’ll enjoy looking at this beautiful garden design and learning about plants that attract bees and butterflies. If we have time, we will then travel the short distance to the Greensboro Arboretum where we will visit the new monarch butterfly waystation. This should be both a fun and an informative afternoon. You don’t need to bring anything but a friend -- or perhaps your mother, because it is Mother's Day! This is a great day to spend time with her. We will cancel the trip if the forecast calls for rain in the afternoon. As always, meet us at 1:45 in front of the Whole Foods Market in Friendly Shopping Center. Look for us under the Sears Plaza sign between BB&T and Chick-fil-A. We plan to depart at 2 p.m. and return to the Whole Foods Market by around 5 p.m.
Help Us Keep Pearson Audubon Vibrant! Pearson Audubon wants your two-cents worth...and then some! Your input makes us the dynamic chapter that so many of you enjoy. Our chapter is as vibrant as its membership. Help us move forward. Pearson Audubon will have an important meeting, its annual planning meeting and officer elections from 2 to 5 p.m. on Sunday, June 5, at the KCE Family Branch Library in Price Park, our usual indoor meeting place. This is your chance to help us to explore what you want to explore! Suggest places to go, topics to delve into, and types of nature for us to put into focus for you, your family, and our community. If you’d like to propose some places for our nature walks this summer or throughout the year, or if you have a really cool idea or hot-button issue for one of our regular meetings, please come to the annual meeting or send us an e-mail with your ideas. We will keep in touch with you via e-mail, our website and Facebook. Several members of the board are rotating off, and we need a few more to rotate onto the board. Many hands are here to help you step up for your Audubon chapter. Reach out and see how enriching this experience can be. 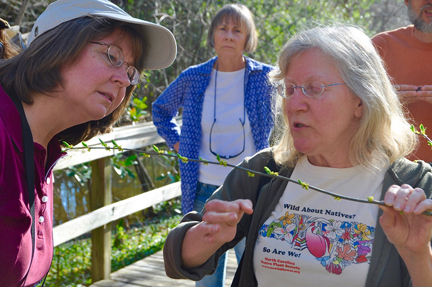 We have had great weather for our Wednesday wildflower walks to area trails and parks. 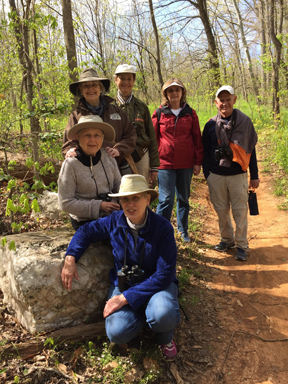 Each week we’ve had a congenial and knowledgeable group of folks participate, with many people from both T. Gilbert Pearson Audubon and the Triad chapter of the Native Plant Society. During the first four walks, we saw at least two-thirds of the species from our target list of 25 wildflowers in bloom. At the Bog Garden we saw clumps of large leaves growing in a low wet area. It was suggested that this is Skunk Cabbage. Judy Stierand discovered that Mark Rose (former president of Native Plant Society) planted Skunk Cabbage at the Bog Garden, making for a positive identification. On several walks, folks asked about fiddleheads. This term refers to the curled up frond of several species of ferns. Only some fiddleheads are edible, with Ostrich Fern (Matteuccia struthiopteris) fiddleheads being most highly recommended for flavor. Some like Bracken fiddleheads are edible only when cooked, because of toxins in the plant. On the Laurel Bluff Trail we saw a blooming shrub in the heath family that, after some research and later discussion, I learned is: Staggerbush, Lyonia mariana. On the Beech Bluff Trail, we saw a violet with a deeply cleft leaf, Viola palmata which is called Blue Wood, Early Blue, or Palmate Violet. 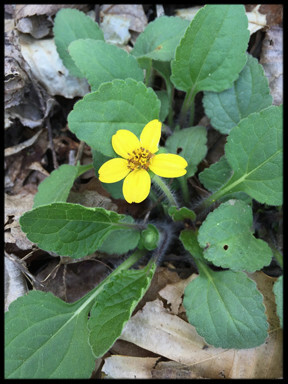 We saw many additional spring ephemerals in bloom on our walk at Marie Poteat’s farm where she has plants native to the mountains (such as Dutchman’s Breeches and Goldenseal) as well as to the Piedmont region of North Carolina. On a beautiful Sunday afternoon in April, seven people joined in a nature walk at Northeast Park. The group walked on the Buffalo Creek Trail, where we saw Spring Beauty in profusion and appreciated the views of the creek. 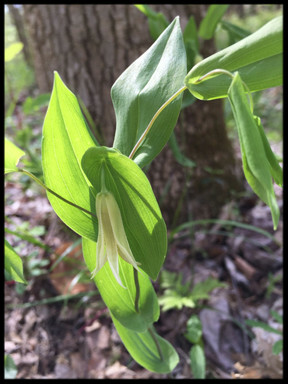 Starting from the Low Water Crossing area, we also walked a short way on the Reedy Fork trail through a bottomland forest, and were delighted to see Golden Ragwort, Perfoliate Bellflower, and Jack-in-the-Pulpit in bloom. The birds the group saw were few and far between -- a White-Throaded Sparrow, Northern Cardinal, and a Turkey Vulture were among the sightings - but everyone enjoyed look for birds and identifying native plants.